What About All of My PlayStation 3 Games? Sadly, it has been confirmed that there will be NO backwards compatibility, meaning your old games are no good on the new system. So, if you planned on getting the PS4, you better also plan on a more cluttered entertainment system, because you'll need to hold onto that PS3 too. However, Sony is offering a compromise. If you've purchased one of a handful of PS3 games, they can be upgraded to a PS4 compatible version. This is where you expect me to say "free," but it's not. You still have to pay for the upgrade, but it's a lot cheaper than buying the game again. Right now, there are only 4 eligible titles that you can upgrade, including Assassin's Creed IV Black Flag, Call of Duty: Ghosts, Battlefield 4, and Injustice Gods Among Us. If you have any of the titles above, you can download a digital copy that will work on your PS4, whether you purchased a digital or hard copy of the game. If you bought the digital version of any of these four games, you will not need to redeem a code to receive their PS4 versions. When you receive your new PS4, just go to the PlayStation Store on your PS4 and it should appear for the discounted price of $9.99. 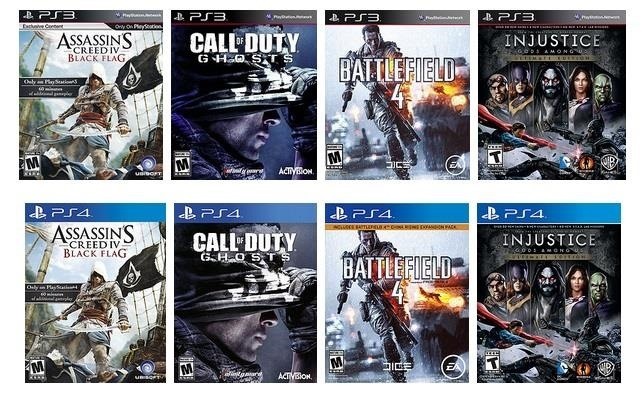 If you bought the disc version of any of these four games, you do not need to wait for your PS4 to arrive. You can use the redeem code at anytime (located in the PS3 disc package), and when your PS4 does arrive, you can download your digital copy. This program is for a limited time only, so don't wait to upgrade these games. You must redeem your code and make the purchase before January 31st, 2014 (for Assassin's Creed IV), March 28th (for Battlefield 4), or March 31st (for Call of Duty: Ghosts). There is no listed deadline for Injustice Gods Among Us. For more details, visit the PlayStation website. If you're a more visual learner, check out the following how-to video by IGN for the overall process of upgrading your games.